Swirl How sits at the heart of the Coniston Fells, with links to other fells to the north, south, east and west. This does mean that the fell is often obscured in the views from the valleys, but the views from the summit are wide ranging and impressive. The most impressive views of Swirl How itself come from the vicinity of Levers Water, where it appears as a series of rocky steps or from parts of Little Langdale, where it appears as one of two peaks at the head of Greenburn. 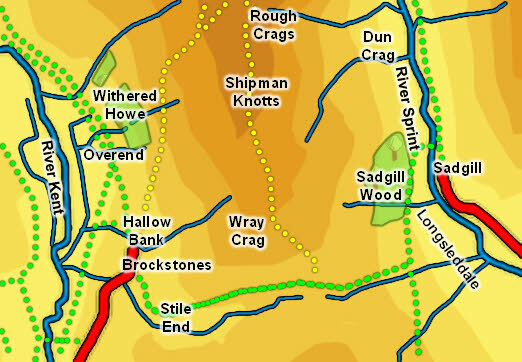 The connection north to Great Carrs is the easiest of the four, running north around the top of Broad Slack. South goes via Levers Hawse to Brim Fell and the Old Man, with a 400ft drop in just about two thirds of a mile. West is a smooth drop to Fairfield then a quick climb to Grey Friar. The most dramatic of the ridges is Prison Band, which runs east from the summit down to Levers Hawse and then on to Black Sails and Wetherlam. Swirl How follows a pattern that is very common in the Lakes, with smooth slopes on one side and dramatic crags on the other. In this case the smooth slopes are to the west, the crags to the east, and this pattern is continued along most of the line of higher ground that runs from Wrynose Pass in the north, across Great Carrs and Swirl How and then south to Brim Fell and the Old Man of Coniston. Swirl How and Great Carrs almost form a single fell, sharing the same gentle western slopes, and with a fairly small drop from Great Carrs to the top of Broad Slack, but the gulf of Broad Slack separates the two summits and makes it clear that they should be treated separately. Because of its central location Swirl How can be reached in many ways, although quite a few involve visiting other fells first. Swirl How can be reached from Little Langdale either by coming up Wet Side Edge (the northern side of the Greenburn valley), or by heading up Greenburn all the way to Swirl Hawse then turning west to climb Prison Band. From the top of Wrynose Pass a path runs up to West Side Edge, then on to Swirl How via Great Carrs. From the Duddon valley the best route is probably via the top of Grey Friar. A right of way is showing heading to Levers Hawse from the west, but it isn't at all obvious on the ground. From Coniston and the south there are several routes. Any route up the Old Man can be used to reach the ridge, which can then be followed to Levers Hawse and up to Swirl How. A direct route heads to Levers Water then follows the path past that tarn up to Swirl Hawse then west up Prison Bank. An alternative direct route passes to the west of Levers Water then up the steep path (really a scramble) to Levers Hawse. Finally the fell can be reached via Goat's Water and Goat's Hawse - head east from the Hawse up to Brim Fell then north to Swirl How. The summit cairn sits above the crags around Broad Slack. Gentle slopes runs away to the south-west, but the northern and eastern flanks are both lined with fierce crags. The upper reaches of Greenburn Beck form the eastern boundary between Swirl How and Great Carrs. The top end of Tarn Head Beck performs the same task in the west, but without making any real impact on the scenery. To the south there is no beck running west from Levers Hawse, and a nameless beck that then merges with Cove Beck in the east. To the east Swirl Hawse Beck runs south into Levers Water while a tributary of Greenburn Beck rises some way below Swirl Hawse. Swirl How can only claim part of one tarn - Levers Water at its south-eastern corner.